I recently read a post about Fads in L&D from my good friend Con (aka @LearnKotch). On some of the points of this post I agreed, but others I think needed a bit deeper deconstruction and more seeking of meaning. By this, I’m speaking about MOOCs. I recently wrote about my experience in a Coursera MOOC of which was my second experience, my first being over a year ago. My concern is about dismissing MOOCs as just another fad though. It’s not. While I agree it’s not the latest greatest thing and going to change L&D forever. It does have a place in the wider scheme of education, from higher education, to corporate learning. Sure MOOCs aren’t accepted by the average Joe at this point. That doesn’t mean it won’t have a profound effect on corporate learning further down the road. Just because the average Joe has not accepted them, doesn’t mean they have no credibility in corporate learning. In fact, most learning activities in L&D haven’t proven themselves in corporate learning! At least not to the extent that gives them a clear dollar value. Then again, things like UX don’t have a clear dollar value, but many could argue that the value a good UX provides is better than the best sales team on the planet. Good content is out there, curated and put into a format that can be used in corporate learning. Now if only the corporation would pull their heads out of you know where and use those resources. A good MOOC could be researched by the L&D department and provided as an option (or requirement) to those deemed as requiring skills in that field. Instead of taking a course on cultural competence, think about the true change that could occur in a MOOC requiring more thought, reflection, and attention. MOOCs are for drop outs! There’s the big problem of people dropping out of the MOOC. This isn’t a problem, it’s just the nature of the system. It’s there for people’s leisure, to get what they need from it, or figure out it’s not for them, so we leave. That means great success in my mind! Significant amounts of time aren’t wasted. Rather than investing time and money into a class or eLearning, an employee can now test the waters. Does this course help me in my job? Do I have enough time to invest in this course? Will my manager back me in taking time to take this course? If a manager won’t back an employee, that’s not a company anyone should be working for! Answer this question: What happens if we don’t invest in their education and they stay? MOOCs can be a valuable part of an employees education, and professional development. My employer is lucky because every MOOC I’ve taken has been in my time, but if it’s related to my job, there’s no reason my employer shouldn’t be paying for it. So, I haven’t finished every MOOC I’ve signed up for and started. I test the waters, figure out if the teacher or content is for me, and if not then I can drop it without inflicting any damage on myself academically or financially. This simple fact is enough for me to call MOOCs one of the most successful experiments in my time. a MOOC to me means free education to those who want it, if it doesn’t fit then you lose nothing. Nobody does. Attendance to the end means nothing, at all. So therefore there is no alarming rate of non-completions, it’s part of the territory and to be expected. Something is wrong if completions are too high in fact! A lot of people are wasting a lot of time, and not getting what they need. There’s no way somebody can tell if they are going to finish a course without testing the material. An inherent problem in the university system is that a lot of people are wasting a lot of time and money doing things they decide they don’t need, or don’t like. This huge problem is eliminated in the MOOC, you’re free to drop at any time, no loss. As far as the current model not being sustainable, that’s not true. There isn’t even a single model to say that statement is true. The fact that there are various acronyms means there are many models. A xMOOC is different from a cMOOC. While I would agree that the xMOOC doesn’t have as successful of a pedagogical model as the cMOOC, it still has its place for certain material. Just like eLearning has a place for certain material, while blended classrooms is better for others. MOOCs next big break-through will be in the corporate world. Most important things do break in the consumer world first and make their way to corporations. MOOCs are no different. I know of at least one corporation here in the United States in the beginning stages of creating a company MOOC. That’s just the beginning stages though. To take advantage of the wonderful resource of a MOOC, a company doesn’t have to create one. All the company needs to do is figure out how to use current public MOOCs. A curated list of MOOCs an employee can take is not enough. They need to be included as part of a custom learning plan for each employee. There’s a MOOC out there that would fit into every type of employees professional development. It’s up to the L&D department to figure out how to get the average Joe to benefit from the many MOOCs out there. If the average Joe isn’t benefiting from them, it’s not the MOOCs fault or average Joe’s fault. MOOCs definitely have a long way to go as I’ve said before. They might be the best thing that’s ever happened to education. They could eventually be the best thing that’s happened in corporate learning also, that just hasn’t happened yet. I’d argue the reason for this is because of the slow-moving nature of the corporation (not to mention tendencies to shun change), no fault of the MOOC. 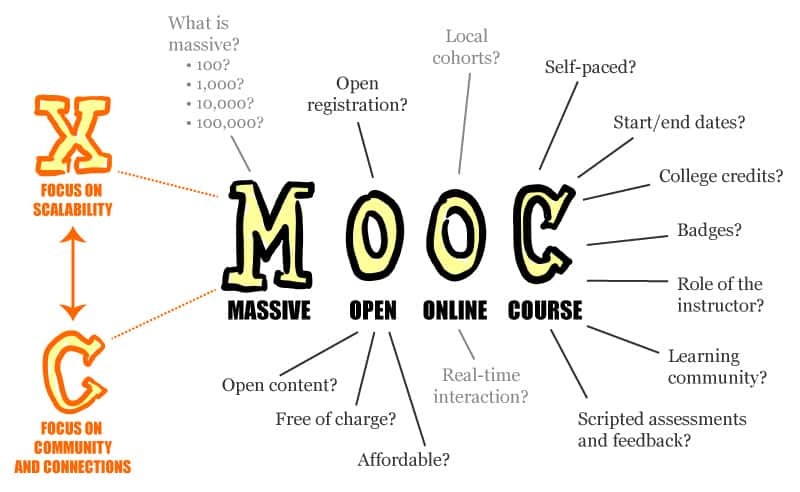 What do you think about the “fad” of the MOOC? Do you think it’s just a fad? Brilliant, Nick. Agree, agree, agree. Thanks Ryan! I appreciate you taking the time to read my post and comment 🙂 I’m sure I’ll have plenty more to say on MOOCs, I’m currently taking one from Leiden University. The topic is way out of my normal expertise but it’s very interesting so I may stick with it (Terrorism & Counterterrorism: Comparing Theory & Practice https://class.coursera.org/terrorism-003). Despite the course not being work related, I’m sure there will be plenty that will help me in my job. Just as there will be for you in yours. Have fun! Yes, variety and diversity of learning can influence some great things in your work. You’re the perfect example, your writing often draw from such different topics and connects it back to L&D, that’s innovation. Have fun in your MOOC! Nice to have a light-hearted one every now and again.